As always, Dr Usochi’s office accommodates my needs. I was sick and couldn’t make it to office two days in arow and was still able to be seen when I finally made it. Dr Udochi is always attentive to each and every patient and our needs. I’m seeing her with my daughter today and she loves coming here as well, she’s 19 and has a choice, she chooses Dr Udochi. As always, Dr Usochi’s office accommodates my needs. I was sick and couldn’t make it to office two days in a row and was still able to be seen when Ifinally made it. Dr Udochi is always attentive to each and every patient and our needs. I’m seeing her with my daughter today and she loves coming here as well, she’s 19 and has a choice, she chooses Dr Udochi. I have been going to Dr Udochi for about 10 years.I love her and her staff.I believe she really cares andwill do what she can to help you. I have been going to Dr Udochi for about 10 years.I love her and her staff.I believe she really cares and will do what she can to help you. Dr. Njide Udochi obtained her medical degree from the College of Medicine at the University of Nigeria in 1988. Certified by the American Board of Family Practice and the American Board of Disability Analysts, Dr. Udochi completed her internship and residency at the George Washington University/Holy Cross Family Practice Residency Program in Rockville, MD. 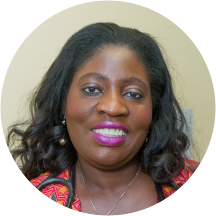 She also completed a fellowship in Geriatrics at the George Washington University Medical Center in Washington D.C. Before opening Millennium Family Practice, Dr. Udochi was employed by Mercy Medical Center and served as the Medical Director of HCH in Baltimore City. Dr. Udochi is certified in HIV Medicine and has experience in Addiction Medicine. She is a Fellow of the American Academy of Family Physicians, and in addition has a Masters Degree in Public Health from the Bloomberg School of Public Health at Johns Hopkins University in Baltimore, Maryland. She is most professional . Dr. Udochi was referred to me by husband. He said she was exceed my expectations and indeed she did. She is extremely thorough and patient. She took time to explain all her recommendations and was very caring. All staff appeard to be very pleasant. She was awesome and caring as usual. Dr. Udochi is an awesome Doctor. After having horrible experiences with pcps in the past, Dr. Udochi is a sigh of relief! Amazing at what she does. Dr. Udochi is thorough. She has a great staff. Dr UDOCHI IS THE BEST !!!! I couldn’t wait to see her and the staff after the death of my mom!!! I just want to that God for DR UDOCHI!!!!! Dr. Udochi is my long time doctor, I have been seeing her for over 13 years. She has seen me through many medical issues and I have been to many other doctors. Dr. Udochi gives each patient her full attention andshe LISTENS. She is by far, the best doctor I have had, and there have been MANY. I feel like Dr Udochi is part of my family and I highly recommend her. Joanne G.
I think they are very caring, great people and a good environment. They get busy but it's worth the wait. I have been there for 6 years and my kids are patients too. Always pleasant and easy to talk to. Little fat from my house but well worth the drive to have everything done under the same roof and always professional. Excellence attention, Dr. Njideka is a good listener, she always has been so kind and she's given me the right treatment to help me feel better. I spent the the time beforehand to fill out all my paperwork online through ZocDoc, but when I got there they told me I had to fill it out on paper. They said that I should have called before I filledit out online, because they would have told me not to bother and to fill out in the office instead (how in the world was I supposed to know that). I basically had to fill out paperwork twice, which is a huge waste of time. If you're going to allow practices to decide whether they want to accept Zocdoc info or not, please make sure that that is clear to the patient when booking online so as not to waste their time. Also, the Doctor was good overall, but I felt a bit rushed when she sat down with me. She wouldn't let me finish my sentences and at times she was moving on to the next question as I was giving my answer to the previous one. Dr. Udochi was very attentive to my needs and she took her time and answered all my questions. She is very professional. I’m glad I picked her as my primary care physician. Dr. Udochi and her staff are first rate. Dr. Udochi is a patient and terrific doctor and her nurse practitioners are terrific too. Great doctor, great bedside manner, excellent care. Dr Udochi and her staff are the best!! I've been seeing Dr. Udochi for over 3 years. She is by far the best primary care physician I have ever had. I am comfortable speaking with her about anything of concern. Her demeanor is always profession and you know thatshe truly cares and is there to help. Offices are clean and comfortable and the staff is extremely pleasant and knowledgeable. This will be my doctor for life! Millennium Family Practice is continually adding services and improvements for the patients. The new sign in and exit procedures help things run more smoothly. The medical attention and advice is outstanding! I recommend this practice often! Like always Dr Udochi has my health and well being as number one priority when I see her. I have been seeing her for 13 years!! I consider her my doctor and a friend who cares deeply for me and my family! This doctors office provides a variety of services in one location. Reduces the need to visit multiple locations for testing and or blood work. Wow, I am very pleased. I did not sit at all before I was called in for vital signs and then the Dr came in to see me in about 5mins. The best experience so far! I also love the new sign in system, more grace Doc???? The providers are very knowledgeable and eager to help. I always receive a warm welcome from the ladies at the front desk. Dr. Udochi has a wonderful team of professionals. The level of care I receive from Dr. Udochi is unmeasured. I am in good hands medically and I appreciate the level of service I receive each and every time I am seen at her office. She’s a fantastic physician ! Very friendly and professional doctor . I really enjoyed visiting Dr. Udochi. She made me feel safe and in good hands. She even cared about the little things. For example when I came in it was a long morning and I was feeling parched while waiting forher. She offered to give me whatever drink that I wanted at her disposal. I asked for orange juice and she quickly gave it to me. I was very pleased and after the appointment it made the rest of my day go by better. Waited over an hour just to get a script refilled ?? Dr Udochi is an amazing doctor how ever the wait times are extremely long . Not pleased with time i waited to have blood work done to long have to go back and thats unacceptable when current blood work was misplacedor what ever happened . I have no other issues other then that. The staff is awesome and professional. I have to be honest and say I was VERY turned off by the wait time and how slow the office staff was. They were not very prepared and they did not pay much attention to the detail, which slowed theprocess even more but when I met with Dr. Udochi I was VERY pleased. She was extremely sweet, very knowledgeable, thorough and was on top of everything. I'll take the interaction with the office staff as a one time hiccup because I've seen so many compliments pertaining to other patients visits. Overall, I'm so happy I was able to find her and that I now have a physician who cares for her patients the way I have been searching for !